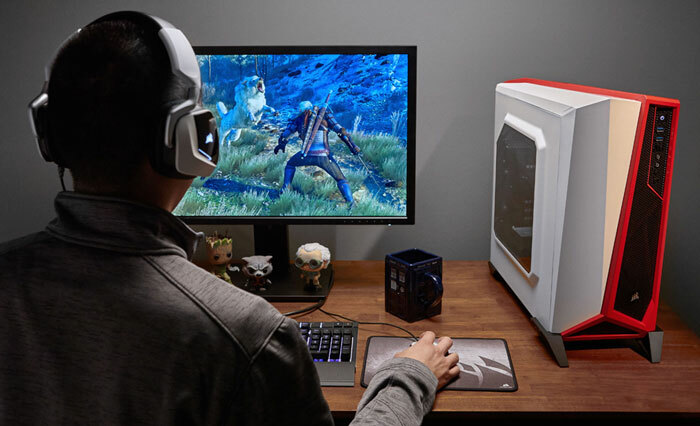 Just ahead of the weekend the Corsair Carbide Series SPEC-ALPHA mid-tower gaming case was launched, with immediate availability. This is a chassis which offers "bold angular styling", efficient cooling and three speed fan control for the three included 120mm fans. The Corsair Carbide Series SPEC-ALPHA was originally shown off at the CES in January. 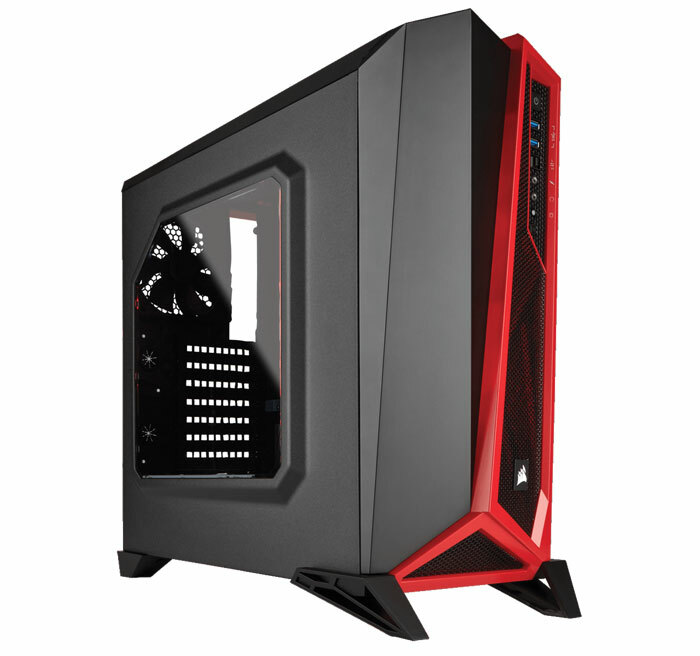 Corsair seems to be rather proud of its "asymmetrical, hard-edged design," and seeks to make the most of the chassis styling by offering various colour schemes such as black/grey, red/white and the previously un-announced black/red combo which matches the pre-installed LED-lit cooling system. Whichever colours you prefer, a "panoramic" side-window shows off the internals and the Direct Airflow Path layout (no 5.25-inch drive cage in this design). The three included fans, linked to the built-in fan controller, are configured as 2x LED lit fans at the front and one at the rear. Alternatively you can easily front-fit a liquid cooling system thanks to front 240mm radiator compatibility. Cable routing cut-outs and tie-downs are provided to keep cabling tidy and airflow unhindered. Corair promises that the SPEC-ALPHA Mid-Tower ATX Case is easy to build, with its tool-less drive installation and side panel removal. ATX, MicroATX, Mini ITX motherboards are compatible with the chassis. The chassis provides for up to 7x expansion slots. Inside you will find room for up to 4x 2.5-inch drives, or 3x 3.5-inch drives. On the front panel you have quick access to 2x USB 3.0 ports, headphone and microphone jacks, power and reset switches and the fan controller. 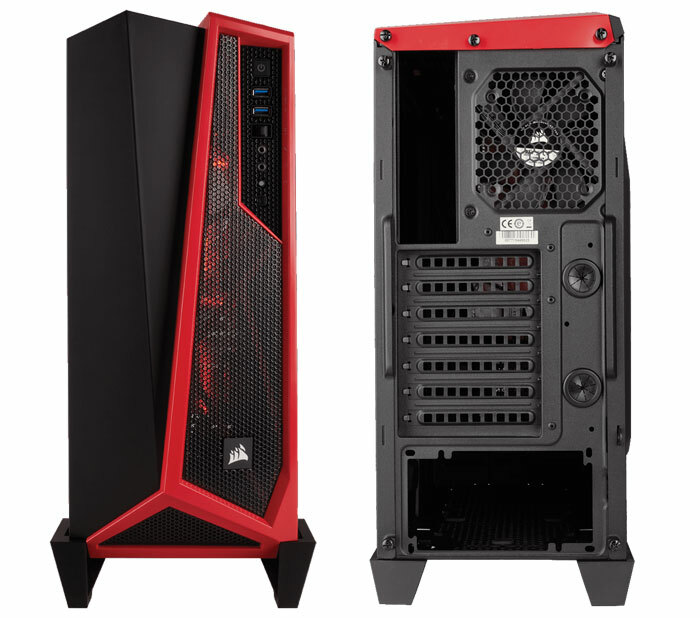 Expect to pay around £79.99 for a Corsair Carbide Series SPEC-ALPHA Mid-Tower Gaming Case. 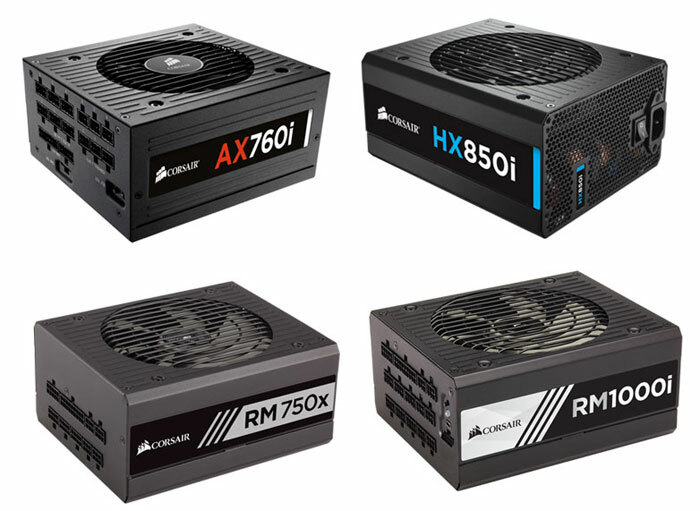 In another announcement on Friday, Corsair extended the warranty, for several of its PSU ranges, by three years. "From today all current and future Corsair AXi, HXi, RMi and RMx PSUs will benefit from an additional three years of warranty, with no extra registration or action required by customers," said the firm. Is that extra warranty applied if you've already bought a Corsair PSU before Friday? It sounds like it: "Customers are not required to register or provide additional information to benefit from this extra coverage. The extended warranty is granted worldwide and across all eligible PSUs sold to date and on all future sales of the eligible PSUs." AXi Series PSUs launched with a 7 year warranty. Now have a 10 year warranty. HXi Series PSUs launched with a 7 year warranty. Now have a 10 year warranty. RMi Series PSUs launched with a 7 year warranty. Now have a 10 year warranty. RMx Series PSUs launched with a 7 year warranty. Now have a 10 year warranty. The warranty of all other Corsair PSUs remains unchanged. Well at least they're trying something different on the outside (the inside looks like yet another bog standard case) but oh my that's a face only a mother could love. Corsair delights with free additional warranty and disgusts with that thing of a case. I think that announcement comes away as a draw, 1-1. To be settled in the return leg? Those plastic feet are just wrong - which is quite fitting as the rest of the case is an absolute bombscare of a design.